As you know I love to stalk real estate listings. 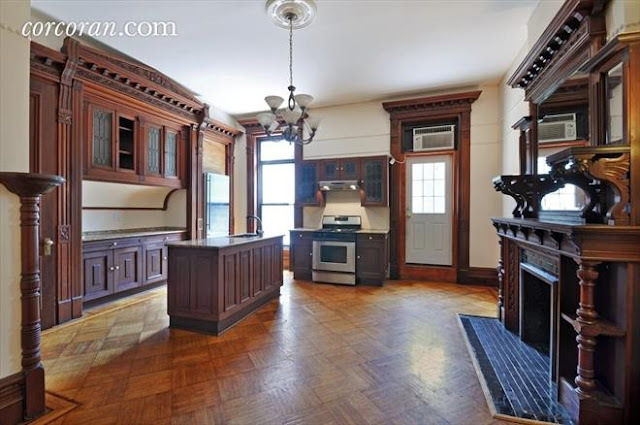 I spotted this kitchen in this pretty Brooklyn brownstone and it stopped me dead in my tracks. At first, I marveled at all the beautiful woodwork that was so perfectly adapted into an open kitchen/dining room space. The room appears to work well with this style of house without feeling too closed in or dark. But then I gave the image a second look and wondered if the kitchen was as functional as I first imagined. That cluttered counter is something I would have a real hard time living with, the space above the fridge seems to be wasted and the shaker cabinets added on the far wall are the wrong style. So as is often the case with old homes, this is definitely a trade off. 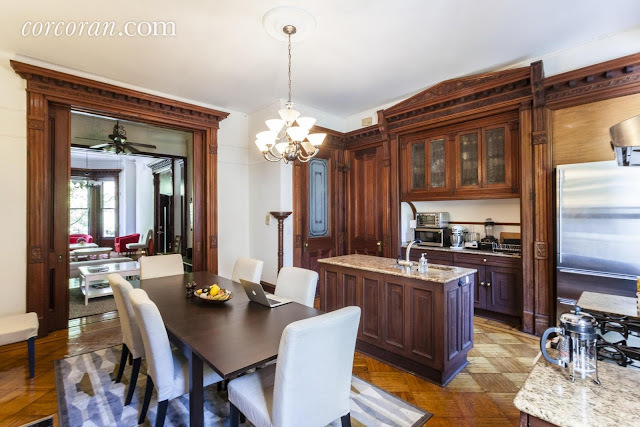 Would it have been worth it to remove some of that gorgeous millwork in exchange for more counter and/or built in appliances? Would the cost of having custom cabinetry made to match the existing molding been too much? Perhaps better furniture, lighting and accessories would have mitigated the cons of the space? What do you think? L shaped island, maybe additional counter/cabinet space against the wall with the fireplace. Make it a real eat in kitchen instead of a kitchen/dining combo. I would remove the shaker cabinetry, replacing with custom to go with the millwork. I would put more storage around pocket doors also by the entry door. I would never touch the Gorgeous millwork because it makes this home. I have it pinned in my style. I'm ready to move in. I agree with Moj Beli Cvet above. Not so much in love with the dining set....would much rather see a victorian oak table with fussy spindle backed chairs....definitely NOT my style but would be perfect in that house. It cries for a kitchen table, not dining room furniture. What's with the plywood over the frige? Wouldn't be so difficult to create open space for displaying a vintage picnic basket. And task lighting...wow, this kitchen really does need a lot more thought! I like the look. I would keep some of the appliances I don't use every day in one of the cabinets. Eliminating the clutter. It's pretty amazing honestly! I would take it and just do a few minor tweaks. I agree with Nicole...a super nice range/hood set up would really turn that space around and modernize it without compromising the millwork..and custom matching cabinets by the fireplace. But there is something wonky about that island. I keep trying to picture a different layout with an island that would make this space work better...I dunno. Those shaker cabinets have to go!